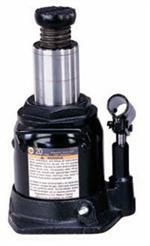 Hydraulic Jacks & Stands | Product categories | Waltco Tools & Equipment, Inc.
Base Size (LxW):4" X 3 7/8"
Base Size (L x W): 4 3/4" x 4 3/4"
Base Size (L x W): 5 1/4" x 5 1/8"
Base Size (L x W): 6 1/4" x 5 7/8"
Effortless air operation will greatly reduce operator fatigue and speed up the efficiency of garage work. A compact, yet powerful Air TurboMotor U.S. Patent No. 5,341,723 is equipped to raise the load to the desire height efficiently, effortlessly, and safely! Versatile "Quick Connector" design provides for easy removal of air hose from air motor allowing compact storage or remote operation. User friendly foot-actuated design for easy control of moving fluid at tremendous rate. Uses 3/8" NPTF fluid coupler. 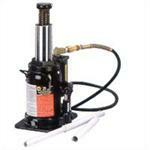 Provides up to 10,000 PSI with standard shop air supply of 90-175 PSI. Made of durable light weight corrosion-free aluminum. Built-in pressure by-pass system protects overload operation. Efficiently operates any single-acting rams up to 55 ton capacity in many industrial and construction applications. 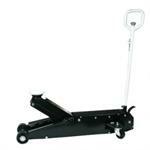 Ton, fits easily and safely between wheels of a tandem axle vehicle. Effortlessly raises saddle quickly, then power lifts to desired height. Handle-top metered-control release valve for easy height adjustment. Quick rated capacity lift using air actuated operation. User friendly self-returning spring minimizes operators effort. 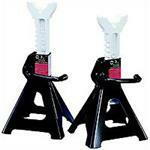 JACK SIZE 22-7/8" x 12-1/2"
A revolutionary technology of super-fast lifting speed for professional mechanics. 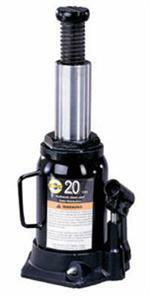 After the first pump reaches the lifting point, the Jack continues with extraordinary lifting speed to raise the load to the desired height. Rugged steel wheels and full swivel ball bearing casters. Innovative design of MagicLift offers a quicker lift for professional performance. Heavy gauge construction with rugged universal joint released valve for professional performance. U.S. Patented built-in by-pass device protects hydraulic system from overpumping damage. Metered release system allows for precise load control. Fast & Safe! 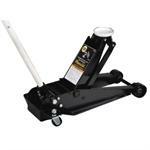 - Extraordinary lifting speed with the One Stroke MagicLift U.S. Patent No. 5,755,099. Ideal to support the exhaust system, shock absorber and other vehicle components during an under vehicle repair. They are not designed to support the vehicle. Fast and safe technology for professional mechanic. Heavy duty welded construction with rugged tubular steel. 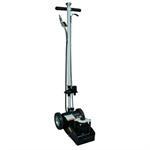 Large wheels and casters for for easy positioning and smooth motion. Roller bearing for smooth height adjustment. 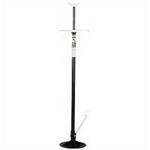 SADDLE SIZE 5-1/4" x 1-5/8"
BASE SIZE L x W 12"
Sturdy welded steel construction for superior safety and strength. One piece multi-position ductile ratchet bar provides super strength and durability, and quick adjustment mechanism that securely locks into desired location. Counter-weighted pawl serves as a safe, secure locking device to prevent the load from accidentally disengaging. Sold and used only in pairs. SADDLE SIZE -1/2" x 1"
BASE SIZE L x W 6-3/4" x 7-3/4"